Doha, Qatar: The global advertising market is undergoing fundamental changes due to changing dynamics and the increased use of digital media. 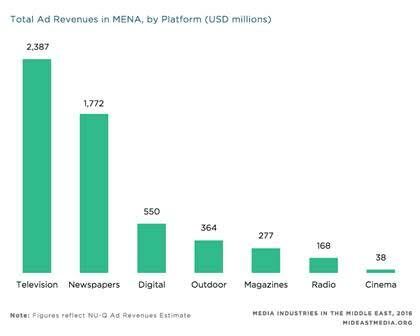 And a recent study by Northwestern University in Qatar (NU-Q) reports that that transition is also causing a slow expansion of ad revenue in the MENA region. The study, Media Industries in the Middle East, 2016 , which was conducted by NU-Q in cooperation with the Doha Film Institute (DFI), reports that over the past five years, the industry has shown a weak but stable growth in the MENA region. In 2015, the total ad market in the region was worth an estimated $5.5 billion (USD) in net advertising revenues. Northwestern University has conducted research related to the increasingly complex media landscape in the Middle East over the past several years. The report found that digital still represents only 10 percent of ad spend, compared to 30–35 percent spend on print. Collectively, MENA countries trail other regions in innovation and adoption of new technologies (e.g., limited digital measurement, programmatic buying, and non-advertising forms of marketing). As a result, many of the opportunities of digital advertising have yet to be realized, despite high levels of digital consumption in the region. Several key dynamics are changing the industry, such as the convergence of advertising platforms (traditional vs. digital) and services (strategy-only vs. execution). The market structure of advertising buyers and agencies in MENA is highly fragmented, with the strong presence and influence of international players. A number of acquisitions are taking place, mainly by international players seeking to break into or expand their presence in the region.